Yey! On Monday evening (12/01) I ordered my first Iconemesis phone case and I was so excited. My old phone case was old and battered so it was time to replenish my phone with a shiny, new phone case. I heard about Iconemesis a long while ago and in the past few months I realised their popularity amongst the blog community. I follow them on Instagram and Twitter, always loved their unique designs, but never gone further. So with the presence of a broken case I ventured onto their website. I was super lucky as they still had sales on with fantastic reductions. I love the range of models that these phones were suitable for, and sales spread across all types. My order also arrived and dispatched super quickly. I ordered on 12th, dispatched during the night and arrived on 15th. 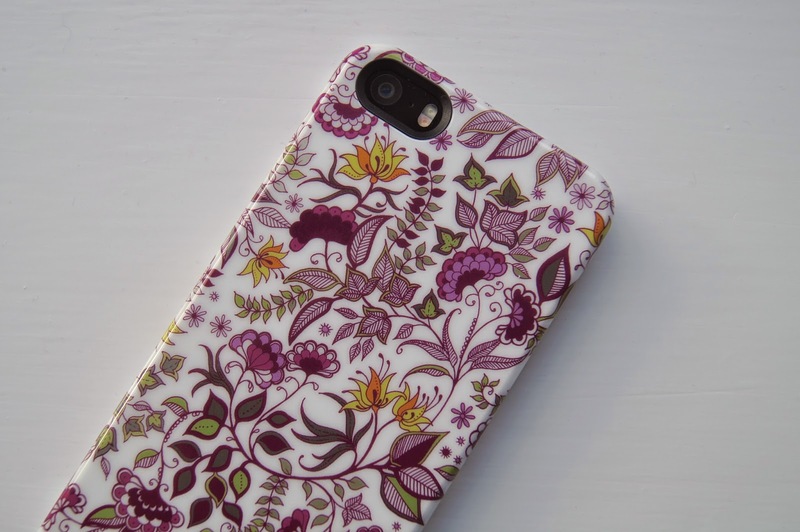 My case is the Johanna Basford Floral Case for iPhone5/5S and with the original price of £19.99 I got it for £7.99, wow! The case design is elegant and subtly girly. I chose this pattern because I really like the theme and colours, which is similar to my old one. The cases have 'Iconemesis' written on the bottom - some designs more prominent that others - mine has it written in gold which blends in really well with the design making it less obvious. The case was a bit tight to get on and I nearly broke a nail but I honestly would prefer it to be tight and protective than easily smashed. When I eventually got it on I was overwhelmed at how smooth and shiny it was; you really do get better quality phone cases when they are not 99p off eBay. My only dislike is the white edge that shows around the screen of my phone. I feel like this can make it look quite plastic-y and bigger unlike clear edged cases. Overall, I really love this case and I would completely recommend them for quality and style. What phone case do you have? Have you checked out Iconemesis yet? Such a pretty phone case, I really need a new one for my 5s might check these out! I almost ordered one of these phone cases last week for a phone I don't even have yet, but this has definitely just swayed it for me ordering one now! Loving this phone case. Looks cute and fabulous. Lovely blog here btw! Would you like to follow each other on GFC? Please let me know on my blog so I can follow back. Thank you. Love the floral design. I used to buy mine on ebay as they are very cheap. And when they get broken it wouldn't hurt so bad. But seeing you caught a good bargain I'd say you got yourself a win-win!